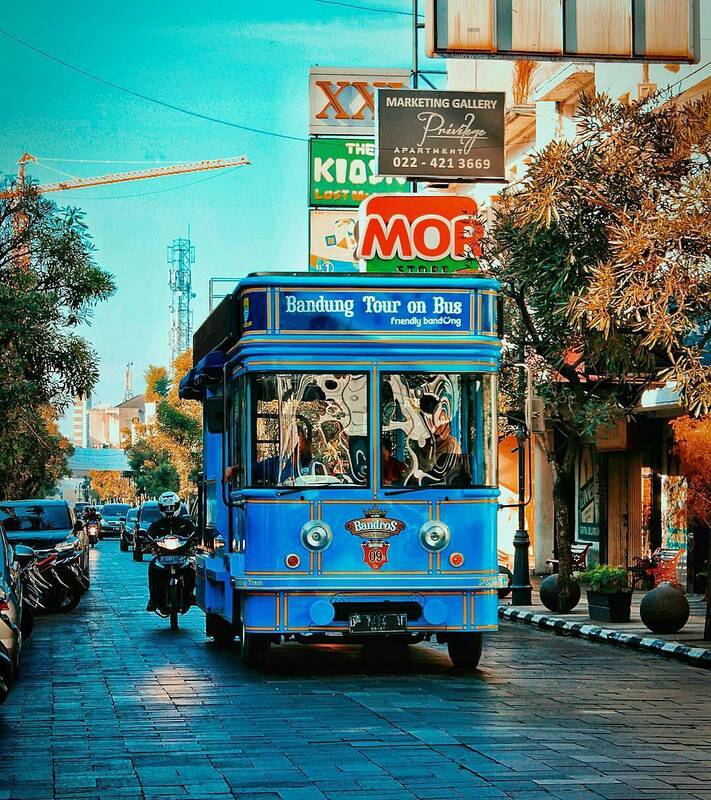 If you want to try something new to explore all around Bandung City, you can try "Bandros" Bus. Bandros or Bandung Tour on Bus is one of great vehicle that you can use wether you go with your group or private. Bandros inaugurated in 2014, it is a form of Corporate Social Responsibility (CSR) with companies that cooperate with the government of Bandung City. This tour bus with a capacity of 30-40 people. This bus is a standard and terraced vehicle (no level), on the other floor there are only 6 round chairs, long chairs then there is a balcony that can be used for tourists to stand. Bandros also has several colors namely red, blue, and yellow. Bandros shuttles had moved several times, such as in Taman Pustaka Bunga, Taman Cibeunying and Alun-Alun Bandung. For now, the bus stop is located in the historical park on Jalan Aceh (Aceh Street). - You need to check reservation via phone 022-7213805 / 085793559911 (Whatsapps) or come to office of Bandros Bus which is located on Jalan Indramayu no.66 Antapani. - The prospective passenger will get a replies from the operator about the schedule and number of seats that can be booked. Reservations can first call the phone number 022-7213805 / 085793559911 (Whatsapps) or come to the office Bandros Bus which is located on Jalan Indramayu no.66 Antapani. As quoted from @BusBandros group of one group charged tariff (donation) 700-800 thousand for 40 people. *Schedule may change at any time.